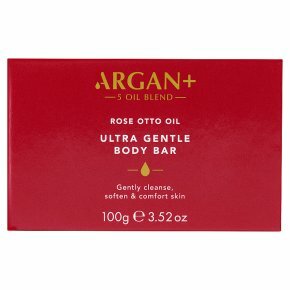 With delicate rose otto oil and precious Moroccan argan oil.This soothing body bar combining the Argan+ Synergy with delicately fragrant Rose Otto Oil leaves your skin feeling softly cleansed and soothed, whilst delighting your senses. Argan+ Synergy is an all-natural 100% blend of precious Moroccan Argan Oil with 4 other amazing oils: Baobab, Kukui, Moringa and Sacha Inchi, all selected for their restorative, regenerating and nourishing properties. Directions for Use: Use with warm water to create a luxurious lather. For external use only. Should irritation occur, rinse well and discontinue use.<br>Avoid direct contact with eyes. If product gets into the eyes rinse well with water immediately. Due to natural oils, colour may vary.